Great Location being Just a Hop, Skip, & Jump to I-77, NO HOA. MLS#3488989. Keller Williams Fort Mill. Tysons Forest - Other features--storage shed, patio, roof (2010), HVAC (2016), garage door (2015). MLS#3489248. Allen Tate Rock Hill. Matthews Estates - House is set-up with a whole house water filter with easy shut-off. County taxes! MLS#3487987. EXP Realty LLC. Westover - This property is being Sold “As Is.” MLS#3488728. Austin-Barnett Realty LLC. Very nice 3 bedroom 2 bath 1 story on large lot, fenced backyard, detached garage/workshop, screen porch, deck, rocking chair front porch, bonus room, large laundry room, fireplace, move in condition MLS#3489450. ERA Reeves Realty & Associates. Carnegie Estates - Property features 4 bedrooms and 2.5 bathrooms, won't last long! MLS#3489378. Listwithfreedom.com Inc.
Make this your new home today! MLS#3487280. Fathom Realty NC LLC. Oakwood Acres - This 3 bedroom, 2 bath home is great for a first time buyer or investor. MLS#3489074. Allen Tate Rock Hill. Downstairs AC unit is less than a year old! MLS#3488007. Allen Tate Lake Wylie. Ebenezer Village - Laundry room conveniently located upstairs with the bedrooms. Roof was replaced in 2014. MLS#3488701. Stephen Cooley Real Estate Group. Sweetwater - You will also enjoy a private fenced yard with a swing and tranquility pond. MLS#3488065. Mark Spain Real Estate. Close to I-77, Shopping, Restaurants, and Downtown Rock Hill. Come See! ! 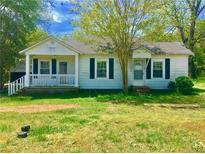 MLS#3468162. RE/MAX Executive. You can relax by your wood-burning fireplace or on the back porch surrounded by privacy! MLS#3484416. Mark Spain Real Estate. Swan Meadows - Presence of asbestos and lead, which are common on homes built before 1980. Please see all reports. Agent-owned. MLS#3487547. MATHERS REALTY.COM. Ellis Pond - Very nice 3 bedroom 2 1/2 bath 2 story in popular neighborhood, wood burning fireplace, large open floor plan, granite, office, loft, great view of pond, fenced back yard, 2 car garage MLS#3487983. ERA Reeves Realty & Associates. Norwood Ridge - Small dog may be in the laundry room, 1GB fiber Optic internet connection. MLS#3487035. Bliss Real Estate LLC. The home has a tankless water heater and the 24 inch stacked Washer and Dryer will be considered by the Seller based on the offer. MLS#3487840. David Ashley Realty.